The George Foreman Cyclo Chef Multi Air Cooker is a versatile appliance to cook your family favourite meals in a healthy, delicious way. The George Foreman SmartTemp Grill features the latest in technology and engineering, offering a host of functions that are designed to improve your cooking experience. The SmartTemp grill features a temperature probe that automatically detects the temperature of the meat cooking, allowing you to grill to perfection. Another unique feature is the Sear function with intense 260°C heat to lock in flavour resulting in restaurant quality steak. Rain, hail or shine, the George Foreman Easy To Clean BBQ Grill will ensure that you are able to cook up a barbeque feast no matter what Mother nature has in mind. With its indoor/outdoor feature, the BBQ grill easily removes from the base and can safely be operated on your kitchen bench. When you’re done, simply detach the plate and place them in the dishwasher. It’s that easy! No more shaking or leftover clumps. 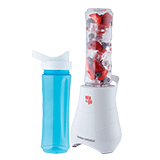 Mix perfect consistency protein powder drinks and meal replacement shakes in only 15 seconds with the press of a button. The George Foreman SuppMix Supplement Mixer is an everyday mixer for powdered supplements including nutrition powder, meal replacement shakes and protein powder.